Sometimes a life-changing event leads people to start a new mission. That’s what happened to Janet Goodman five years ago. Goodman woke up one morning with blurry vision and unquenchable thirst. Her doctor ran some tests. The results showed she had type 1 diabetes. The news came as a shock. Type 1, previously known as juvenile diabetes, is usually associated with children and young adults. Goodman was 61 at the time. She also is thin, follows a healthy diet, works out six times a week and has no family history of diabetes. She also began looking online for something to carry the diabetes equipment she now needed to keep close at hand. The search proved to be frustrating. Medical bags were too drab. Oversized purses required a search-and-rescue mission. Since she knew how to sew, Goodman decided to create her own diabetes carryall — one with style, fun and function. After a few attempts, the first yadaBag prototype was born. “It made me feel better. You can’t have a depressed psychologist,” she laughed. The product’s name comes from Seinfeld, the TV sitcom credited with the “yada, yada” phrase that’s become part of everyday lexicon. YadaBags’ Classic Purse has ten custom compartments to organize a diabetes glucose monitor, test strips, insulin, lancets — yada, yada everything. Goodman founded her business in July 2011. Next came over three years of market research and design modifications to go from concept to product. During that time, she investigated 52 manufacturers before selecting a facility in New York City to produce the first round of bags. In December 2014, she had her first official yadaBag to sell. 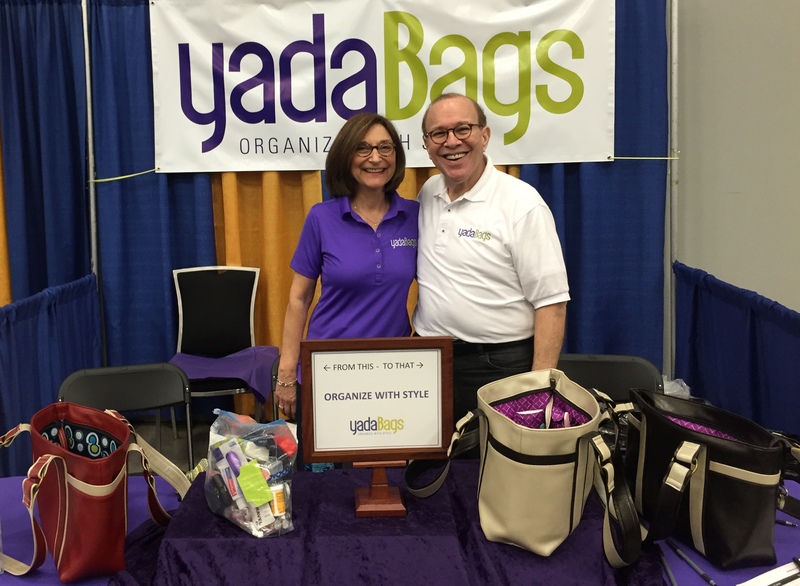 To accommodate different budgets and users, yadaBags will soon introduce several new designs produced by a manufacturer in Portland, Oregon. Among the additions: a girls mini-bag, a boys backpack with a snap-in case and an organizer case for use inside a larger bag. Several factors positioned Goodman to launch yadaBags. She’s a careful money manager and understands the startup process from her work as a business coach. She comes from an entrepreneurial household (her husband started a software company for real estate property managers). From those endeavors, she knows the importance of a business plan. The one she wrote for yadaBags was 35 pages and included a SWOT (Strengths, Weaknesses, Opportunities, Threats) analysis. “It helps me make decisions,” she said. She’s also benefited from being in the right place at the right time. While attending a conference sponsored by Inc. magazine, Goodman met a television producer who became interested in her story. That connection eventually led to an appearance on MSNBC’s Your Business. Like many late bloomers, Goodman has different priorities than she did when she was younger. Goodman, who’s now 66, has ambitious plans for her company. She wants to branch into new industries and produce custom-designed bags for visiting nurses, seniors and people who are infirmed. None of this will be easy but the inventor of yadaBags isn’t deterred. “You have to be willing to be discouraged and to do it anyway,” she said. Any other advice for aspiring entrepreneurs? Be willing to pivot and change direction. Have a clear vision. If you don’t know where you’re going, you can’t get there. Be open to feedback. Don’t be too entrenched. November is National Diabetes Month. Visit the American Diabetes Association and JDRF websites to learn more about diabetes. This entry was posted in Business, Career Changes, Careers, entrepreneurs, Entrepreneurship, Leadership, Retirement, Success and tagged fashion, fitness, health, Interviews, Work. Bookmark the permalink. I hadn’t heard of the golden circle theory until I read your comment. I learned something new today. Thank you. I enjoyed this post. Nice to see how someone took a negative event in their life and turned it around into something positive, not only that but turned it into a business opportunity. Plus it’s a business that helps others who are managing a chronic disease. Thanks for reading.